Developing a data archiving strategy and selecting a suitable solution has become one of the most important business traits. It requires a significant amount of effort to identify your data retention requirements and technological solutions. A one-size-fits-all archiving solution is not going to add any real value to your business. Salesforce admins must take their business data requirements into account before implementing a data archiving strategy. 70% of your business data are potentially archivable, that means you don’t use them on an everyday basis. But you can’t delete them because of compliance reasons. A data archiving solution can archive those less used data and save you paying additional storage cost. The data archival need differs from business to business. But understanding the requirement for archival storage is the key to start with. The reasons for data retention differ considerably; however short or long-term data retention for governance requirements falls into three basic categories. Data saved within a compliance archive category is retained to fit regulatory and audit requirements. Enterprises who archive data for compliance reasons, store it as a part of their record management, risk management, and compliance readiness strategy. Compliance archive data basically includes emails, texts, files, social media records, business records and other content. Access to these data is infrequent and only required at the time of audit or request. Your archiving solution must offer easy data retention, whenever required. Data archived under historical category is retained as a record for the business. Data which falls under this category are basically large volumes of content that can’t be deleted for various business reasons. Historical archives are accessed very rarely. So, you need a solution which is cost-effective and reliable to retain these data. Data archived under analytics archive category is used for reporting or analysis purpose. Compared to compliance and historical archives, analytics archive data is used more frequently. In general, the volume of the data is more and you might need analytical archiving solutions to access the data effectively. 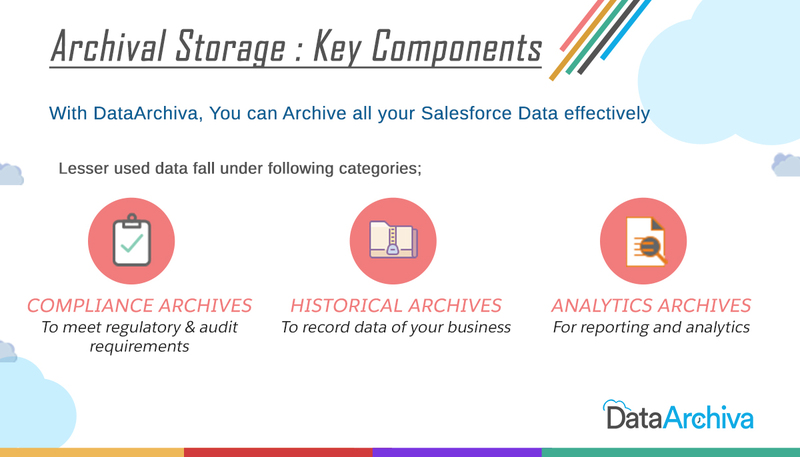 DataArchiva is a Salesforce native application, which offers a structured data archiving solution by significantly reducing your additional Salesforce data storage cost. It is a compliance-ready, user-friendly and highly scalable application that can manage a large volume of data without any hassle. By enhancing your application performance, DataArchiva will save up to 80% of your Salesforce storage cost. By 2020, the volume of archivable data will be tripled & enterprises have to spend a huge amount to store their data. In an age where data is exploding in volume, using a data archiving solution is still the best and easiest way to manage your data storage requirements.